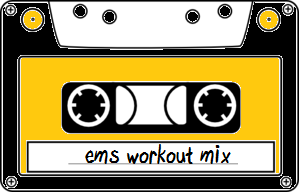 Here is this months mix tape, inspired by every ones new years resolutions to workout and get into shape!! I love exercising in many many different ways, mostly some good weight lifting with a run or two thrown in the mix. Some people are really picky about what they listen to when at the gym, but for me, anything with a really strong fast beat works like a charm getting me motivated and energized. I did however choose some good favorites for this mix ranging from the old to the new. Once again all the songs are lined right up in a "mix tape" format, with each song leading you to a YouTube video of the performance. Today is mix tape #2. (inspired by the fabulous bluebird) view my first easy listening mix here. I hope you enjoyed the song list today!! and if you find a new song or artist for that matter that you really like let me know!